sailboat. : Monday Pick Me up! On a gloomy Monday afternoon, what better way to spend half an hour than a little online browse. With Christmas fast approaching I'm on the lookout for gifts for a few people that seem to have just about everything and are so difficult to buy for. As you get older, in my experience anyway, you tend to stop needing so many things. Sure there are still things that you'd like, little odds and ends here and there, but a lot of the time you have everything you need. For those people who are comfortable and settled I tend to go for gifts that have that little touch of luxury to them, nothing too extravagant but just something I know they will love that they probably wouldn't ever buy for themselves. 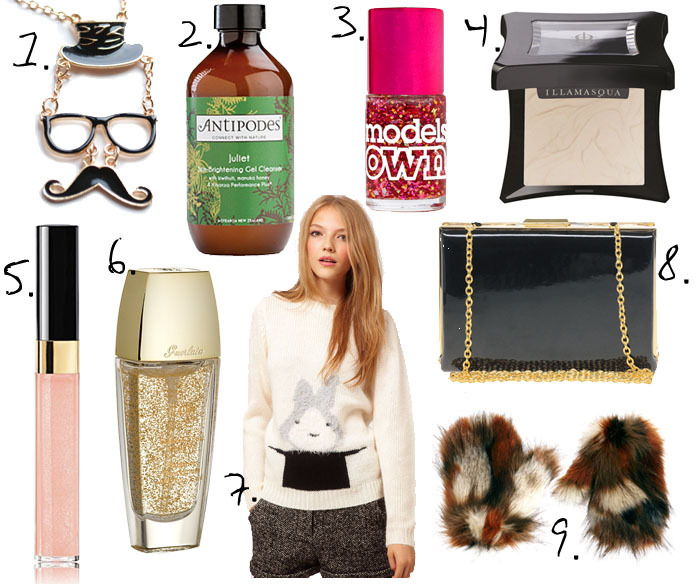 Let me know if you'd like to see any Christmas gift guides, I'd love to put some together! 1. Hero&Cape Top Hat and Moustache necklace. 2. Antipodes Juliet Skin-Brightening Cleanser. 3. Models Own Hot Stuff Nail Polish. 4. Illamasqua Gleam Highlighter. 5. Chanel Allegorie Glossimer. 6. Guerlain L'Or Make Up Base. 7. ASOS Bunny in a Top Hat jumper. 8. Oasis Patent Korea Box Clutch bag. 9. ASOS Faux Fur Patchwork Mittens. 1. November is the month of Movember and Hero&Cape are supporting Movember by donating 5% of every moustache related item sold to the cause. This Top Hat and Moustache necklace is so cute and the perfect way to get involved with Movember if you can't grow a real 'tache of your own! 2. I've been hearing a lot about Antipodes recently and since I am a bit of a skin care geek it was only a matter of time before I found myself lusting after something from the range! The Juliet Skin-Brightening cleanser is said to reveal clean, clear and blemish free skin. I'd definitely like that thank you very much! 3. I'm not the biggest fan of Models Own nail polishes, I find they tend to chip really easily on me, but who could possibly resist this pink sparkly shade called Hot Stuff from the Mirror Ball collection? It's stunning! 4. During the colder months I'm all about the highlighting products, especially when my skin is super dry and looking a bit lackluster! Illamasqua Gleam compact highlighter from the Generation Q collection looks completely perfect with pearlescent pigments for a glow with light reflecting properties. 5. Chanel's make up line has been calling my name for a little while now. I don't own anything from the range but there are so many things I find myself looking at over and over again. I've definitely got my eye on a couple of the lipsticks and blushes but the Glossimer lipglosses are something I've been hearing a lot of good things about recently. The shade Allegorie has really caught my eye, I know it's very much a sheer and almost nothing kind of colour, there's just something so simple and pretty about it that I love. These are super pricey though, are they worth it? 6. Okay, so this looks like prettiness in a bottle and it's the Guerlain L'Or Make Up Base. Essentially it's little bits of gold in a gel primer. I've never heard anyone talking about this, I've never read any reviews but I want it. And I don't know why. I highly doubt I'd ever actually use it, it'd just sit there looking pretty on my dressing table, which is ridiculous so I think this will be one of those things I admire from afar! 7. Hello bunny in a top hat jumper! You look cosy and oh so cute!! 8. I'm a sucker for beautifully simple and elegant black clutch/evening bags. I never ever go anywhere where I would ever need one but this Oasis Patent Korea Box Clutch has stolen my heart. I think it's SO pretty! 9. I can't believe how super freezing cold it is in Derbyshire already this year, I'm lacking on the warm winter clothes front and these super cute faux fur mittens look so cosy. Mittens are always incredibly impractical and I always get annoyed with them, but I'm willing to overlook that fact because these Faux Fur Patchwork Mittens from ASOS are so beautiful! Have you got/ever tried any of these things before? I love that chanel lipgloss shade, it is just gorgeous. I have a chanel quadra eyeshadow and I love it- it applies so well and lasts all day. I love the jumper too! Love the look of that nail polish! Both two and three are on my Christmas list, itching to try some Antipodes skincare! The Guerlain Base and Chanel Glossimer are so pretty. I've never even heard of or saw that Guerlain base before. How cute is that jumper!? I've been seeing quite a bit of moustache jewellery around, but I love the idea of adding in the glasses and top hat. How cute is that necklace! The Models Own 'Hot Stuff' polish is gorgeous. I use it layered over Essie's Bahama Mama (there is a photo of it on my blog). It is a really really christmasy colour!